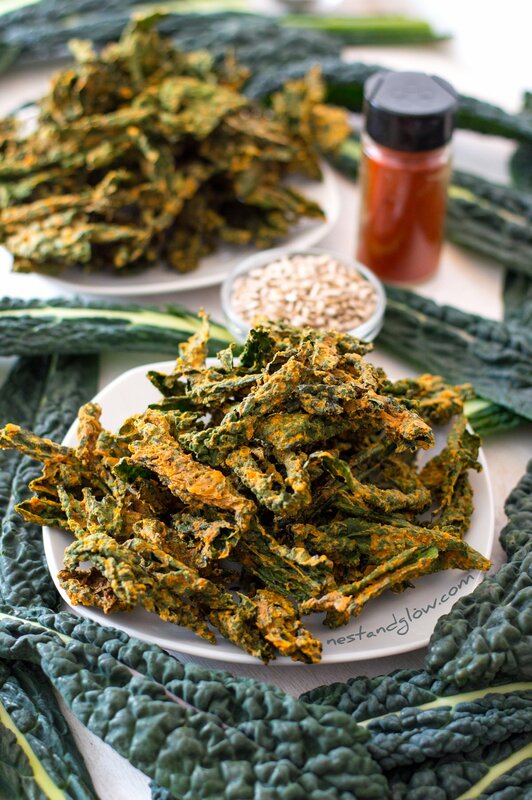 Kale crisps are a ridiculously healthy and delicious alternative to deep fried potato crisps. 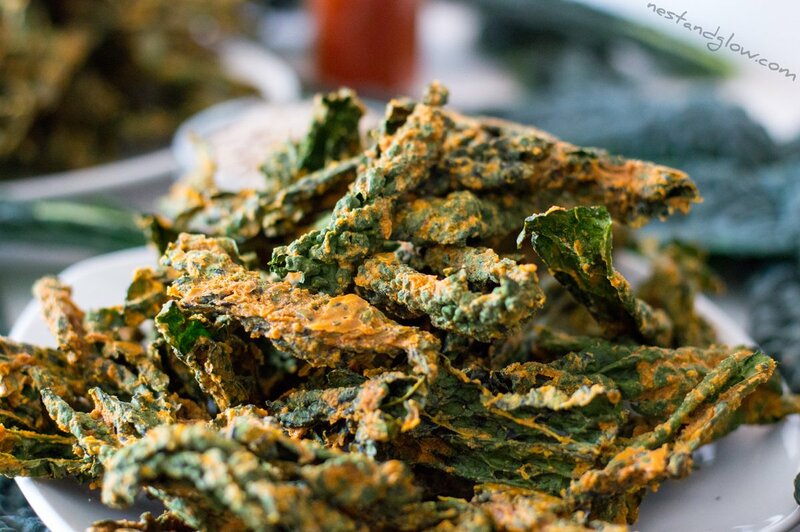 You can make these kale crisps either raw using a dehydrator or cooked using a normal oven. Suitable for vegan, nut-free, gluten-free, paleo, oil-free and general healthy diets. These healthy crisps are high in calcium, iron, fibre, protein, fibre and vitamins A, C and K. Most importantly they taste delicious. I’m using cavolo nero / black kale in these as it’s my favourite type of kale. You can use any variety of kale that you like but try to buy whole kale leaves rather than the chopped ones in airtight bags. The prepared kale in bags looks good but it’s been washed in chlorine and placed in an airtight bag and can often be much lower in nutrients. The sunflower seeds are soaked to sprout and activate them. This makes the nutrients easier for the body to absorb. Even if you only have 15 minutes do still soak your seeds – just the murky water alone is enough to convince you of the importance of soaking. It’s been part of many cultures to soak nuts and seeds before eating. Massaging your kale may sound weird but really its the best way to describe it. Firstly it’s massaged with salt and apple cider vinegar in order to break up the tough cell wall that cruciferous vegetables like kale have. This makes it easier to cook/dry and for your body to absorb it. The second time it’s massaged to coat in the sunflower seed based sauce. With the second massage make sure to coat all leaves but avoid any clumps as they won’t dry properly. I always use a dehydrator to make kale chips. I’m including the oven method as some people might like that one to get started. 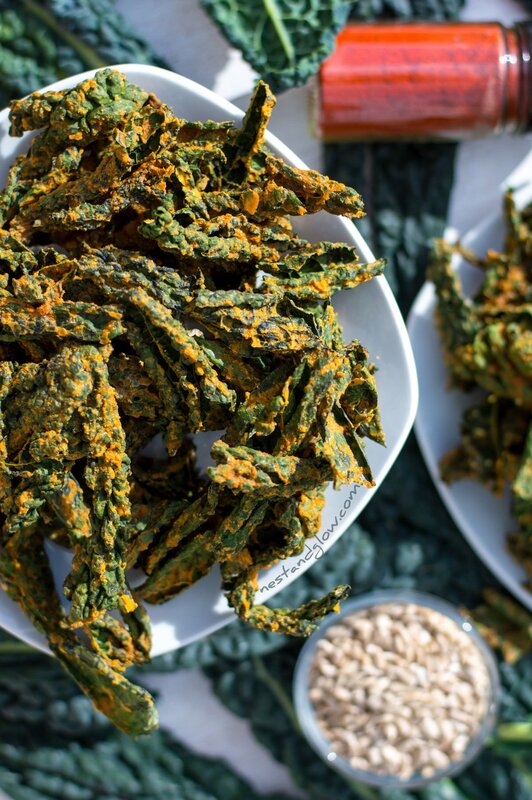 A dehydrator is foolproof to make kale crisps in as you can’t burn them. The only way you can go wrong with a dehydrator is by having balls or clumps of kale that don’t dry, but that’s no big issue as you can just spread out and dry for a bit longer. It’s worth having a dehydrator just for kale crisps in my opinion. I’ve had my dehydrator for 15 years and it was expensive back then (£279) but now they are more mainstream and can be picked up relatively inexpensively. If you have stored kale crisps that have lost their crunch, just place back in the dehydrator or the oven for a short time to crisp them back up. They won’t be quite as good as fresh kale crisps but will still be nice and crispy. Raw foodists generally consider that food should not be heated above is 103F / 40C. I set the dehydrator thermostat a bit above this as the food is heated a few degrees lower than the thermoset temperature. Soak the sunflower seeds in water with a pinch of salt. Overnight is best but 15 mins will do. Rip the kale off the stems. Just remove up to where the stem snaps; the stem near the top is tender enough to eat. Place the kale in a bowl and sprinkle over a pinch of salt and the apple cider vinegar. Scrunch the kale up using your hands until its halved in size. Drain the sunflower seeds and place with all the remaining ingredients into a blender then blend until smooth. Pour the sunflower sauce on the kale and massage to coat all the leaves. Bake; spread out thinly onto a lined tray and bake at 300F / 150C for about 20-30 minutes. Toss every 5-10 minutes and take out of the oven as soon as they are dry. Watch like a hawk as they burn easily. Raw; spread out thinly onto a non-stick sheet. Dry at 110F / 43C for 10-12 hours tossing halfway. 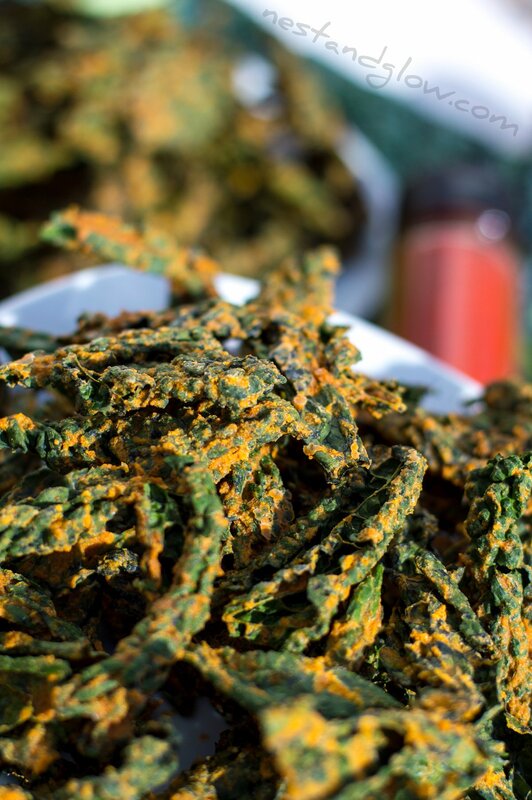 Enjoy the kale crisps straight away as they are ready and at their most crunchy. Once cooled they can be stored in an airtight container for a few weeks, but it’s best to have them the same day as they lose their crispiness. Equipment; Blender, Oven/Dehydrator and Greaseproof Paper/Dehydrator Sheets. Can you substitute the sunflower seeds with pumpkin or almonds?